Can This Minimum Volatility ETF Reduce Your Risk? This exchange-traded fund is beating the market while providing a smoother ride versus peer ETFs. 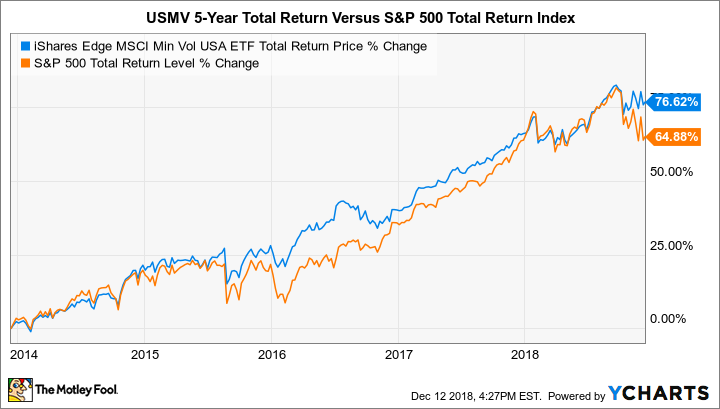 A few years ago, in an article about "smart beta" strategies, I mentioned the iShares Edge MSCI Min Vol USA ETF (NYSEMKT:USMV) as a potentially lower-risk alternative to exchange-traded funds that closely mirror the S&P 500 index. ... measure the performance of large and mid-capitalization equity securities listed on stock exchanges in the U.S. that, in the aggregate, have lower volatility relative to the broader U.S. equity market. While the fund acts as a rough proxy to the U.S. equities market, as represented by the S&P 500 index, it differs subtly from widely followed, S&P 500-tracking ETFs like the SPDR S&P 500 ETF (NYSEMKT:SPY) or the Vanguard S&P 500 ETF (NYSEMKT:VOO). First, in order to produce an aggregate volatility lower than the broader market, the USMV index (and by extension the USMV ETF) must focus on individual securities with relatively low beta coefficients. True to its advertising, the USMV ETF's current beta of 0.67 means the fund is only two-thirds as volatile as the broader market. Image source: S&P Dow Jones Indices. Data as of Nov. 30 2018. This pie chart is fairly representative of the U.S. economy; a highly developed, consumption-based economy that relies on advances in technology for a significant portion of gross domestic product (GDP) growth. Three thematic sectors -- information technology, healthcare, and financials -- represent just under 50% of the entire industry allocation S&P 500 index. Chart by author. Data source: iShares by BlackRock. Data as of Nov. 30, 2018. Consumer staples hold a much larger weighting in the USMV index's composition. In fact, the total consumer sector (consumer staples plus consumer discretionary) enjoys about 4.5 percentage points of higher representation in the USMV index versus the S&P 500. As I've argued in recent weeks, utilizing sector-specific ETFs to invest in consumer staples and consumer discretionary stocks is a core component of a defensive strategy. In another nod to stability, the USMV index assigns roughly 2.5 times the weight of the relatively tame utilities and real-estate sectors than its peer benchmark index. The USMV index also differs in its approach to individual component weighting. As a capitalization-weighted index, the S&P 500 index has a tendency toward concentrations in its biggest constituents. Together, just three stocks comprise more than 10% of the index: Microsoft (approx. 3.7% of the index), Apple (approx. 3.5%), and Amazon (approx. 3%). The top 10 holdings in the S&P 500 index account for more than 21% of total holdings. Data source: iShares by BlackRock. Data as of Dec. 11, 2018. Investors should note a few other basic facts about the fund. While not an indexing behemoth like the SPY or VOO ETFs, USMV can boast of being fairly substantial, with $19.3 billion in net assets. It's also an efficient investment vehicle, carrying an annual expense ratio of 0.15%. USMV's trailing-12-month price-to-earnings ratio of 23 is in line with the S&P 500's aggregate P/E ratio of 22. As for shareholder income, the fund's current distributions yield 1.8% annually. It may surprise some to learn that since its inception in October 2011, the USMV ETF has posted a robust average annual return of 14.25%. It's outpaced the S&P 500 index slightly since its launch, posting a cumulative return of 118.5% versus the S&P 500's cumulative return of 116.3% over the same period. In the current year, the fund's lower volatility focus is paying off, as it's gained 5% versus a dip of roughly 1% in the S&P 500 index -- an impressive six percentage point spread. USMV Total Return Price data by YCharts. So, in the final analysis, can USMV reduce your risk in the market? The answer is: It likely can. Reduced volatility doesn't ensure reduced risk. However, given its sector approach and constituent weightings, the fund seems to me to be better equipped to handle systemic risk (i.e., the risk that a single company, industry, or sector may encounter an adverse event) than ETFs that replicate the S&P 500 index. Image source: iShares by BlackRock. USMV's preference for slower growth but stable sectors additionally gives it an edge in handling systematic risk, also known as market risk -- the risk that an adverse event will affect the entire stock market. Recent performance bears this out. According to the fund, its correlation with the S&P 500 is currently 83%, meaning that directionally, it moves in step with the S&P index roughly 83% of the time. From the first full month after its inception through the end of September 2018, the USMV ETF has captured roughly 80% of the S&P's upside, but just 52% of its downside movement. In other words, at least in the past, USMV has delivered a superior return with less downside risk -- an attractive trait for those looking to stabilize shaken portfolios.